Today many healthcare computational workloads still exist at or near the point of care because of high latency, low bandwidth, or challenges with wireless power requirements and limited battery capabilities. Limitations on the numbers of connections per cell are also poised to stunt the future growth of IoT (Internet of Things). 4G LTE has typical latencies of 50-100ms, bandwidth less than 50Mbps, and in the range of thousands of connections per cell (maximum). This has forced users to spend capital buying expensive, powerful hardware to be co-located at or close to the point of need, and to secure and maintain that hardware over its lifetime. In the case of IoT and wearables these limitations have either prevented certain use cases or significantly limited capabilities. 5G has a latency of less than 1ms, bandwidth of up to 10 Gbps, and up to a million connections per square KM! This is going to pave the way for many new innovations in healthcare. I discuss a few of these below. 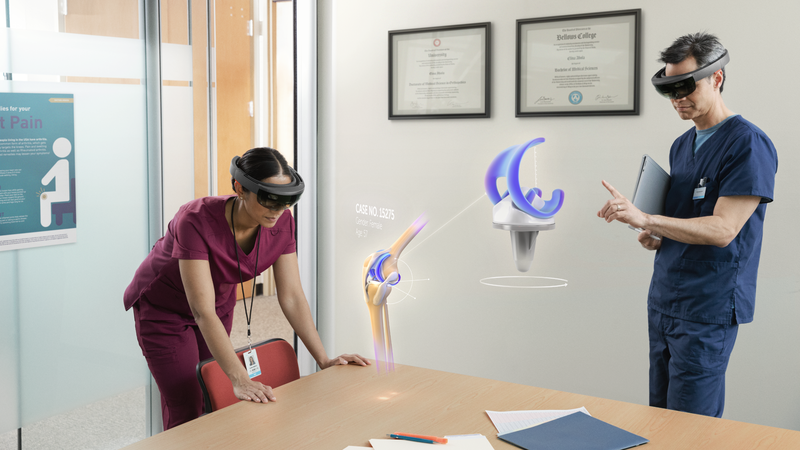 Microsoft HoloLens today enables MR (Mixed Reality) in healthcare. The AR (Augmented Reality), VR (Virtual Reality) in healthcare market was recently valued at USD $769 million in 2017 and is expected to reach USD $4,998 million by 2023, representing a CAGR of 36.6 percent during the forecast period. 5G latencies are low enough, and bandwidth high enough that the computational workloads associated with AR / VR / MR can run in the cloud and be delivered to the patients or healthcare workers headset via 5G. This can include both workloads to generate models — for example, a VR model for a specific patient created using images taken of that patient — as well as workloads to display the model to the user and enable the user to navigate through and interact with the model in real time. The net effect of enabling these technologies from the cloud is that AR / VR / MR will require less capital outlay for user hardware; the only hardware required by the user will be the “thin client” to drive the headset display and audio, and the 5G radio. This will make AR / VR / MR economically feasible for a myriad of use cases that promise to improve healthcare, from patient engagement and education, to healthcare worker training, surgical planning and simulation, treatment for PTSD, and many others. Healthcare market research in 2017 estimates 4.5 billion IoMT devices existed in 2015, accounting for 30.3 percent of all IoT devices globally. This number is expected to grow to 20-30 billion IoMT devices by 2020! These will include patient wearables, as well as IoMT devices in healthcare environments and in patients’ homes. In many cases, IoMT devices will be connected to the cloud via 5G—which is capable of supporting millions of connections per square KM. 5G will also enable IoMT devices to connect with low bandwidth, and low-power options will enable these devices to include lower power radios with longer lasting batteries. In turn, 5G will enable the proliferation of IoMT devices around and on patients, while greatly increasing the data available to advanced analytics, artificial intelligence and machine learning. In turn, those processes will deliver new insights to healthcare workers in real time, empowering them to deliver improved healthcare and patient outcomes. Microsoft Azure Sphere will secure these solutions end-to-end from IoMT devices to the cloud. Every year 3.6 million American patients miss doctor appointments due to a lack of reliable transportation, resulting in “no show” rates as high as 30 percent. Uber Health and Lyft Concierge already remove transportation as a barrier, enabling healthcare organizations to provide patients a convenient transportation option. This improves attendance at doctor appointments, and thereby healthcare. Autonomous driving will further reduce the cost of such transportation and improve patient safety during transportation. 5G will enable computational workloads that support autonomous driving such as optimal routing, maintenance, patient engagement/entertainment, and communications. 5G will also facilitate others moving to the cloud, further reducing the cost of autonomous driving, and ultimately helping to reduce the cost of healthcare. These are just a few of the workloads that 5G will enable to be delivered from the cloud, helping to reduce healthcare costs, and improving the quality of care and patient outcomes. Many new healthcare use cases will emerge as 5G becomes more broadly available and new types of affordable, scalable, cloud-based computational workloads become possible. 5G Rolling Out in 2018! All major wireless providers are working on 5G rollout. Verizon is planning to offer 5G in multiple cities in the US including Sacramento and Los Angeles starting in Q4 2018! Are you factoring 5G into your IT / Cloud plans? As healthcare plans IT for next 3-5 years it is important to take 5G into consideration as it opens new opportunities to move workloads to the cloud both for the use cases discussed in this blog, and many more. I post regularly about new developments on social media. If you would like to follow me you can find me on LinkedIn and Twitter. What other opportunities and challenges do you see with 5G and cloud computing in healthcare? We welcome your feedback and questions.